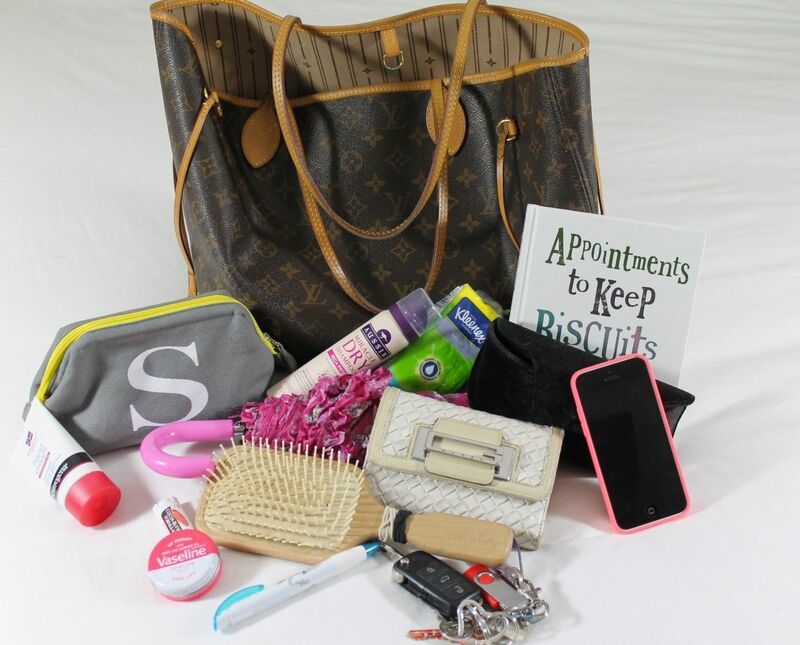 So, I was recently tagged by the lovely Kat from Beautwins to take part in a ‘What’s in My Bag’ Tag! Hurrah! Because I most certainly am! 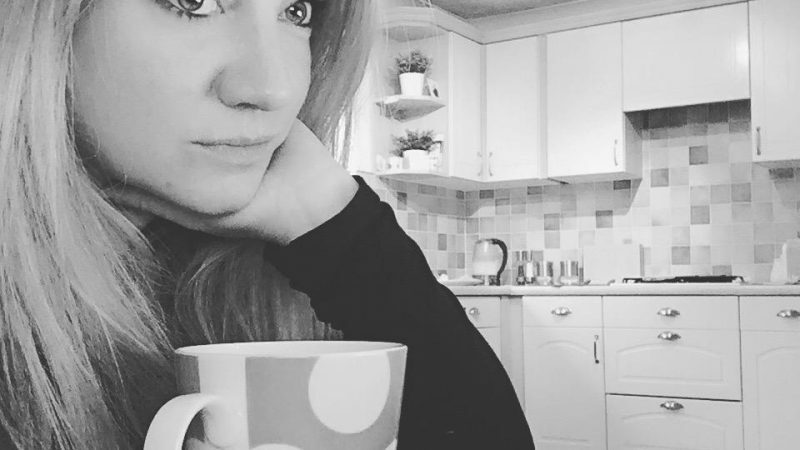 And what’s better than having a voyeristic little sneaky peek into the general day to day ‘stuff’ that our fellow mummies carry around with them each day. And obviously being the uber-organised mummy blogger that I am (! ), I have happily obliged to take part. PS: Please don’t get too excited! 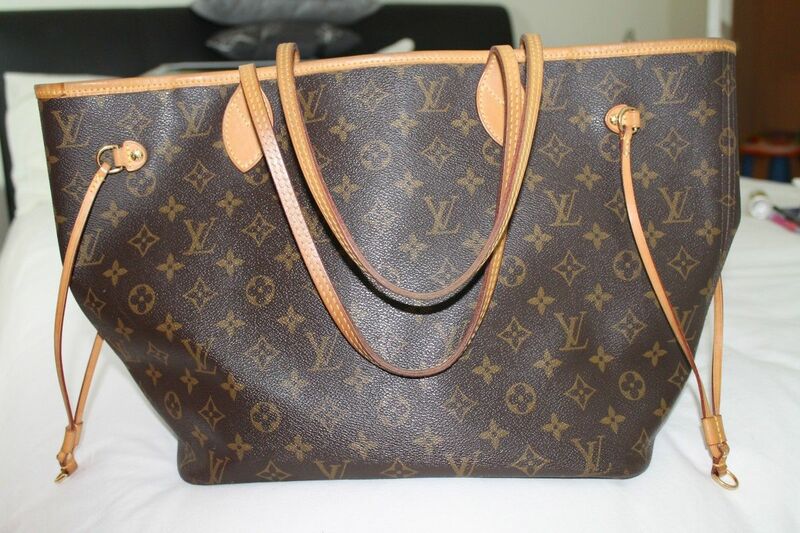 The Louis Vuitton Neverfull in MM. It’s a bit of a ‘Mary Poppins’ bag – not in that it’s made of carpet(!) – more for the fact you could pretty much pull a standing lamp out of it, it’s SO spacious! which has been fantastic over the past few years with little ones – as there was never really enough room in the change bag itself! Sometimes I must say though – it’s bordering on a little TOO spacious perhaps, as I’m constantly losing things and I can often be that annoying person in front of you at the till checkout who’s rummaging around the bottom of her bag looking for shrapnel! 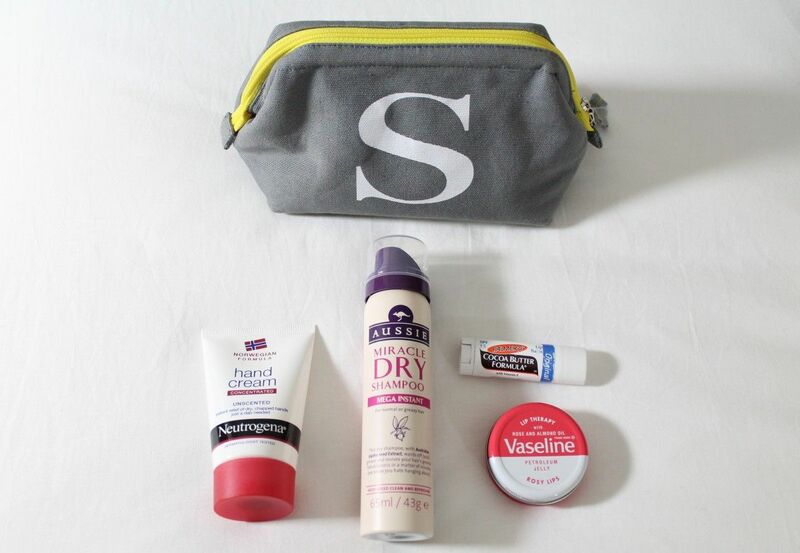 Right so now let’s take a peek inside…..
Oliver Bonas Alphabet Make Up Bag – full of the usual gadgets and gizmos I have to use on a daily basis to look decent enough to venture outside without scaring the other children in the road on their way to school! I’ll let you take a sneaky peek in here in another post! Neutrogena Norwegian Formula Hand Cream – my hands are always a bit dry and sore, so its always nice to have a hand cream with me. Aussie Miracle Dry Shampoo – I’ve been meaning to try this for a while as i use other products in the Aussie range – but i’ve not tried it yet – hope it works ok! Vaseline Rosy Lips lip Therapy – always lives in my bag as a quick pick me up for my lips. Palmers Cocoa Butter Lip care – and this one too – another little gem for perfectly pucker-up-able lips! 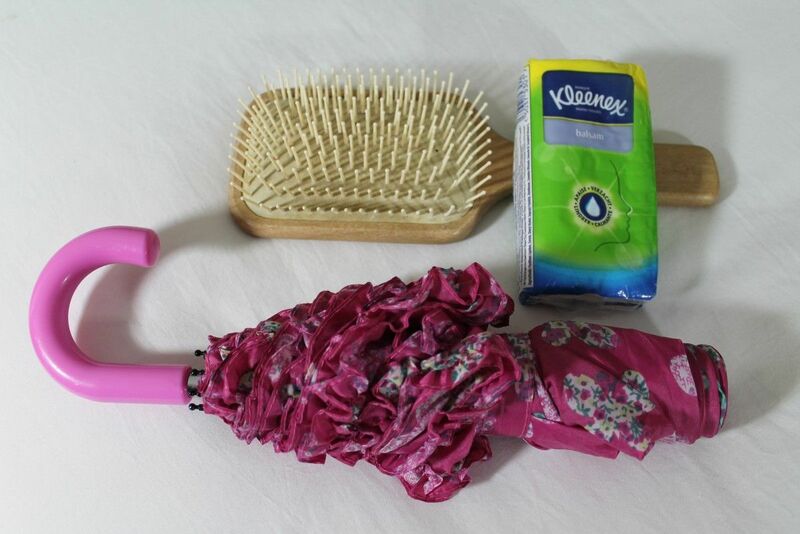 Hairbrush – Perfect for keeping my mop in check throughout the day! At last I can try! Tissues – I cry all the time – whether it be through reading something sad, or through laughing too much. Plus I have hay fever and allergies – so always best to have on my person! Umbrella – well, it’s actually not really mine. It’s Holly’s. I bought it for her from Accessorize a couple of years ago. But it’s very cute and fits just perfectly into my massive bag! Purse – gosh this is so old and in need of desperate replacement!! It’s from Guess and I think it must be a good few years old now (as with most things in my bag by all accounts!). Note to self: buy posh mew purse!!! 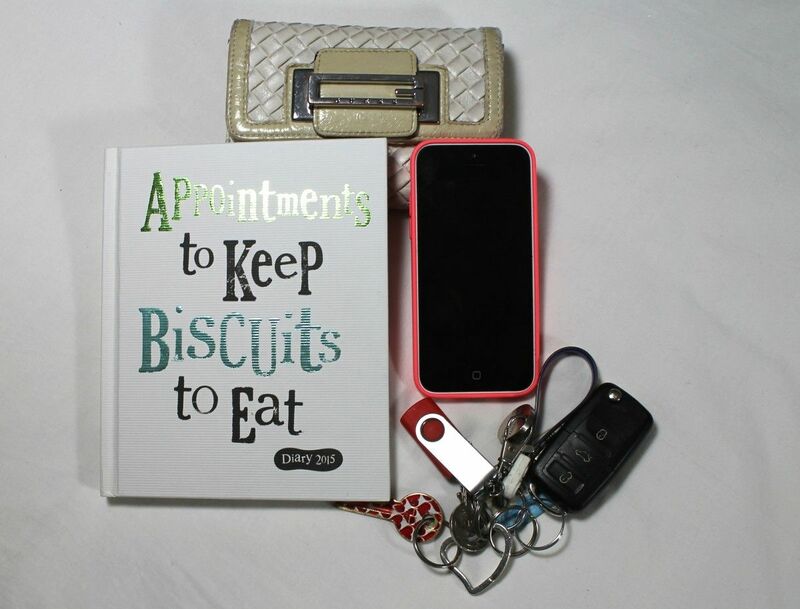 Diary – I received this for my birthday from my friend – it’s so handy to jot down little notes, my to dos, reminders, birthdays and appointments. Phone – or should I say BFF! It ought to be really with the amount of time I spend with it!!! I rather love my iPhone – but it annoys me a bit too! I never seem to have enough storage as it was the smaller size – so I’d like the one with more capacity – but my Vodafone contract doesn’t run out for a couple of years!!! Keys – House key, car key, parents house key, Tesco reward card, memory stick and a trolley coin – all held together by a Tiffany key ring I was bought by my old boss. Sunglasses – these were a bit of an impulse buy really. I had hoped that there’d be an Accessorize at the airport when we went on holiday as my trusted Next sunglasses had finally given up the ghost. But alas, there was no Accessorize, and in its place a Sunglasses Hut instead. 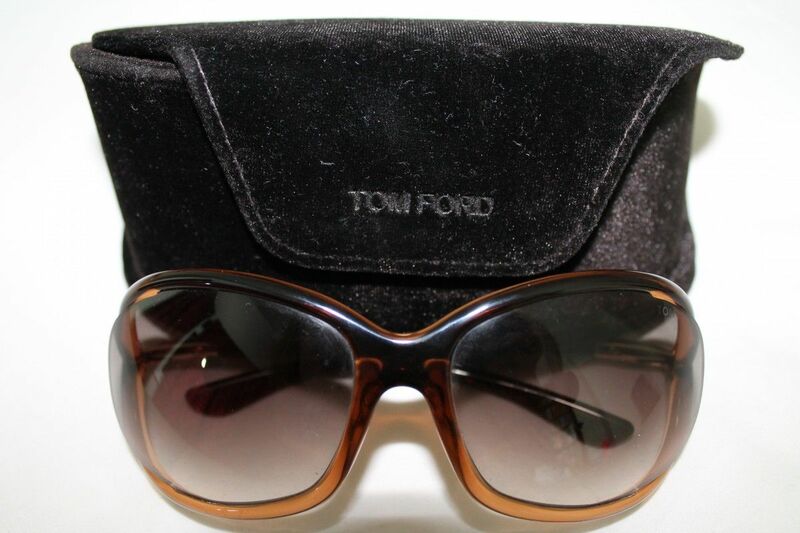 And the pair that most closely matched the Next pair that had now unfortunately broken, were these rather more expensive Tom Ford lovelies!!! Ooops!! So there you have it – the very tidy and organised (if a little old!) 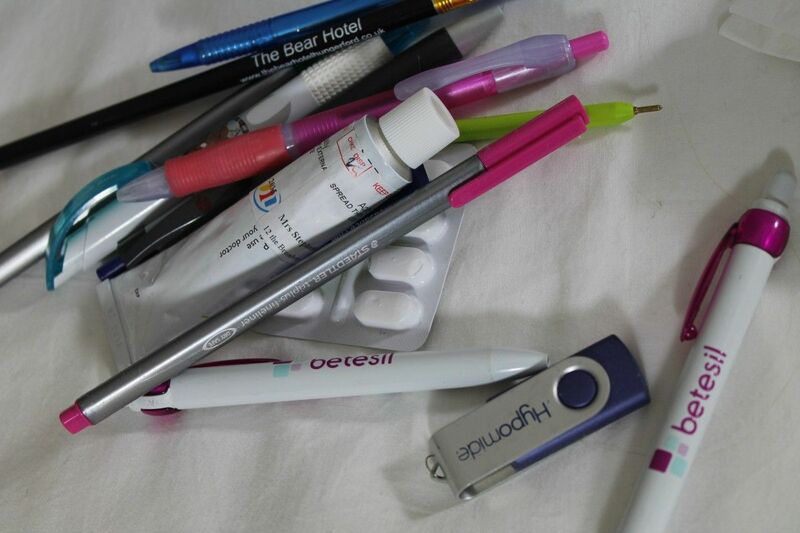 contents of my bag! 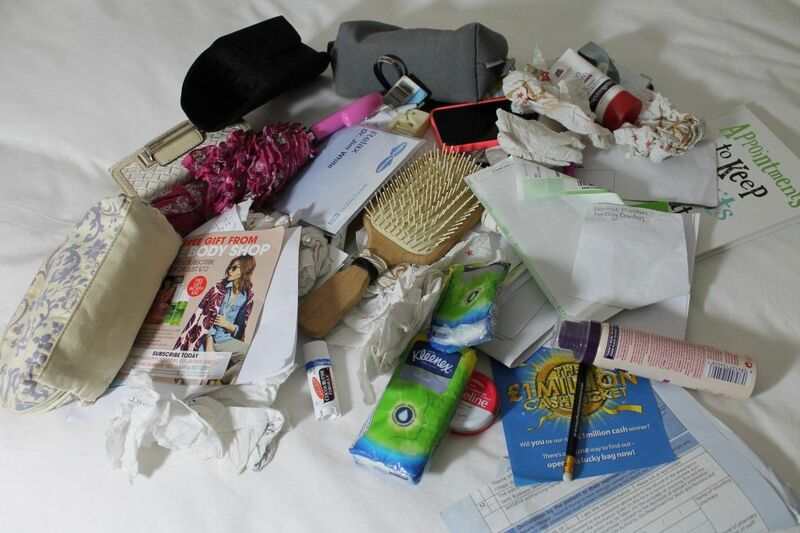 Ah – who am I kidding…… this was REALLY what was in it…… I am actually totally messy, disorganised and disgusting!!!!! So anybody else out there fancy sharing the contents of their bag too????? Previous Post Golf is boring!! Love this! Mine looks very similar! Yay, finally a messy (or at least someone who’s able to admit it’s messy) bag! !